This week's episode apparently continues the advancement of Russell's modelling career, as both he and Zoe have to deal with a passive-aggressive coworker. Again, no stream this week. Sorry. Okay we find out who Mona Autumn's assistant who is now a named character went insane. That poor woman, she needed a day off, she needs a month off. So we finally have a pet villain. At first I thought this plot was going to be about Zoey being paranoid. 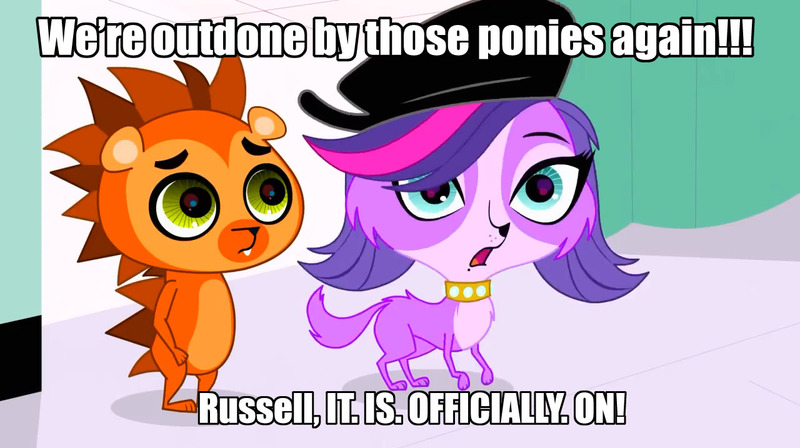 But she is not, it develops the Russell / Zoey relationship. Zoey who had been jealous of Russell in the past has grown past that and is now looking out for him which is nice character development. And Blythe saves the day at the end, and Mona becomes more and more like a mentor to Blythe. I am disappointed that the pets were in the same building as Mona, and they don't meet or interact with Ciaro. I hope they would meet someday. A solid episode all in all, event hough the cast was small. I know I am pushing my luck with possible jinxes, but another Jasper free episode. Keep it up. Nice to see we're getting same-day 1080p TVRips now. We used to have to wait for Ryaless for iTunes for 1080p!